Could This be the Best Year for a Roth IRA Conversion? Traditional IRAs generally provide a tax deduction for the amount you contribute. The money grows tax-deferred until you withdraw it. Then it is taxed at your ordinary income tax rate. You must begin required minimum distributions (RMDs) by April 1 following the year you turn 70½ and do so every year thereafter. You don’t receive a tax deduction for the amount you contribute. But the principal and all earnings grow tax-free for you and your heirs. And there are no requirements that you must withdraw funds at a certain age. In other words, once money is in a Roth, it can stay there forever without the IRS or anyone else telling you have to remove it or pay income taxes on principal and growth. When you do a Roth conversion you’ll have to pay income tax on the amount you convert. The rate will be based on your ordinary tax rate. So the best time to convert is when you’re in the lowest tax rate possible. I know… voluntarily sending your hard-earned dollars to the IRS takes a strong stomach. But thanks to the Tax Cuts and Jobs Act (TCJA) of 2017, your tax rate may never be this low again. Starting in 2018, most tax rates have been reduced. This means many people will pay less tax. Here’s a look of how the recent tax change affects the two most common methods of filing, single and joint, for 2019. Note that the TCJA is set to expire on Dec. 31, 2025. What will happen then is anyone’s guess. If Congress allows the tax code revert to pre-TCJA status, most households would experience tax increases beginning in 2026. And considering the direction our nation’s deficit is heading, I’d say the odds are pretty high that we’ll have higher tax rates in the future. As a hypothetical example, suppose you have $100,000 in a traditional IRA. It’s not all yours. Remember you have that nagging silent partner, the IRS, wanting a piece of it. You decide to bite the bullet and buy that partner out. It’ll cost you $24,000. Assuming you are a long-term investor, twenty years go by. If your Roth IRA has earned 7% per year, the $76,000 you converted is now worth around $298,000. It all belongs to you and your family. No taxes, no required distributions. In another 20 years, the $298,000 continuing to earn 7% per year could grow to more than $1 million. Again, no IRS expecting a handout. Do you own stocks or other investments in your IRA that have taken a temporary dive? Converting them to a Roth while their values are lower and the resulting income tax is less could be a good strategic move. The same when the market is down. But it’s tough to time the market. So you might consider dollar-cost-averaging the conversions, for instance quarterly over five years, just like you do when investing. That way more shares are converted when the market takes a dump. Also systematically converting will help you monitor your tax bracket. You don’t want to convert so much that it pushes you to the next highest bracket. Meanwhile keep a watch on how those conversions might affect the taxability of your Social Security benefits. And if your income is sporadic, late in the year when you can accurately estimate your earnings might be the best time for a partial conversion. The first could be based on keeping your traditional IRA as is and using the current tax rates. How much will your silent partner, the IRS, take once you begin RMDs? And how will that affect your heirs? The second, the same as above but with 2017 tax rates. The third might be converting your traditional IRA to a Roth in one lump sum and paying the tax using your current tax bracket. Fourth, converting to a Roth over several years. You may find that Medicare Part B premiums increase the year you convert if your income crosses the “higher-income” threshold of $85,000 for an individual or $170,000 for a married couple filing jointly. The tradeoff is that all distributions from your Roth IRA will be completely tax free. Roth conversions are irrevocable. That means you must be sure. Will you need the money immediately for living expenses? If so, converting might not make sense for you. Do you believe your tax rate will be lower in the future? If yes, that will be a factor against converting. Will the money to pay the income tax come from your IRA? It’s better to pay the conversion tax from non-IRA funds. 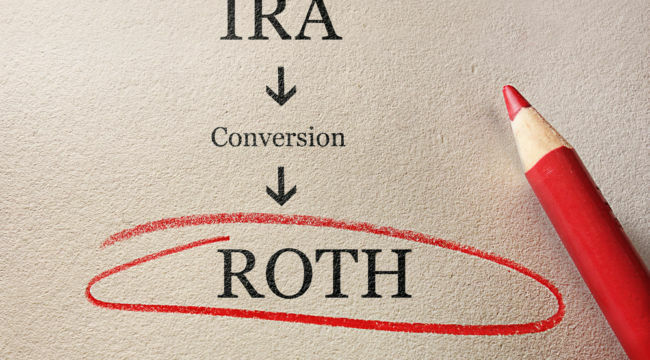 Should everyone convert their traditional IRAs to a Roth? Still, it’s worth exploring because current tax rates aren’t going to stay where they are forever, making this possibly the best year ever to convert.